Purchase any Steelcraft product and save 10% OFF the original price! - Ford F150 Forums - Ford F-Series Truck Community. Purchase any Steelcraft product and save 10% OFF the original price! Your Ford truck is your chariot, and you expect it to handle anything the road throws at you, but sudden collisions with other vehicles on the road and even deer sometimes can not be avoided. If you're looking for additional protection in the form of the aftermarket bumpers, bull bars or grille guards, Steelcraft has got you covered. Their truck accessories feature fully-welded construction for easier installation, and superior protection. Manufactured of the highest quality materials, they are designed specifically for your truck to ensure perfect fit and simple bolt-on installation. All Steelcraft Products are electrocoated, or E-Coated, for maximum durability, which results in a completely seamless bond between steel and finish, with 100% coverage. You've heard enough about it, now its time to give it a try! Purchase any Steelcraft product and save 10% OFF the original price. Hurry up to take part in this Sale! Prices are already reduced. Act now, this big offer expires on November 29, 2016. 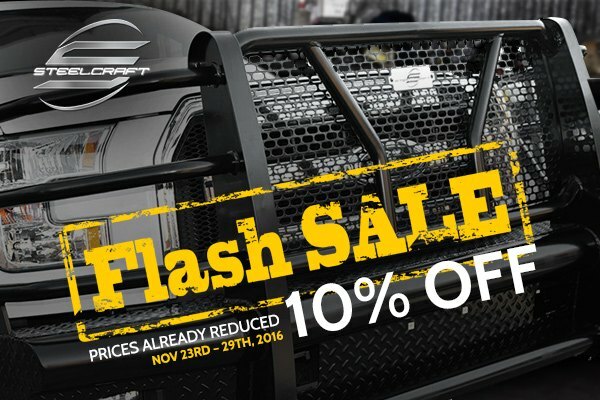 Grille Guard Savings from Steelcraft at CARiD! Don't miss your chance to buy Go Rhino products for F-150 and save up to $250! Quick Reply: Purchase any Steelcraft product and save 10% OFF the original price!